Emilio Pucci Appliqued Silk-Charmeuse Dress – do we love it? | Do We Love It? 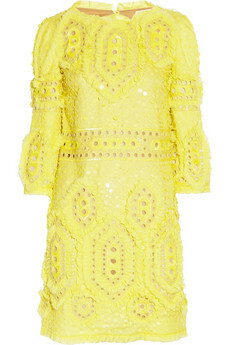 Emilio Pucci Appliqued Silk-Charmeuse Dress – do we love it? Alright kids – it’s time to talk about my friend Emily again. Emily and I are pretty much the same person. Except she has brown hair and mine is blonde. That’s just about the only difference. Seriously. *I’m sure many, many Belgian nuns hand-sewed every stitch on this dress with such precision they ultimately went blind from all of the tiny, detail work. In Emily’s defense, she did say she was “not in love with” the sleeves. I, on the other hand, would prefer to light everything from the waist-up on fire and start over. Okay, that’s probably a bit of an exaggeration. I could maybe see this possibly working if you cut off the sleeves just below that band on the upper arm and open up the neckline somehow with a little crew or scoop neck. Maybe. This entry was posted on Tuesday, May 1st, 2012 at 5:59 pm	and posted in Uncategorized. You can follow any responses to this entry through the RSS 2.0 feed. In my defense, it’s not really a fair question to ask if we love it like Emily does or hate it like you do. Because you clearly vehemently hate it while I kind of love it. That is no excuse. You’re just jealous that I’m winning.